We are 3/4 of the way through the Eight Days of Hanukkah Giveaway. Have you checked out the previous five days? Go for it! You still have a chance to win some fun products from some of my favorite companies. 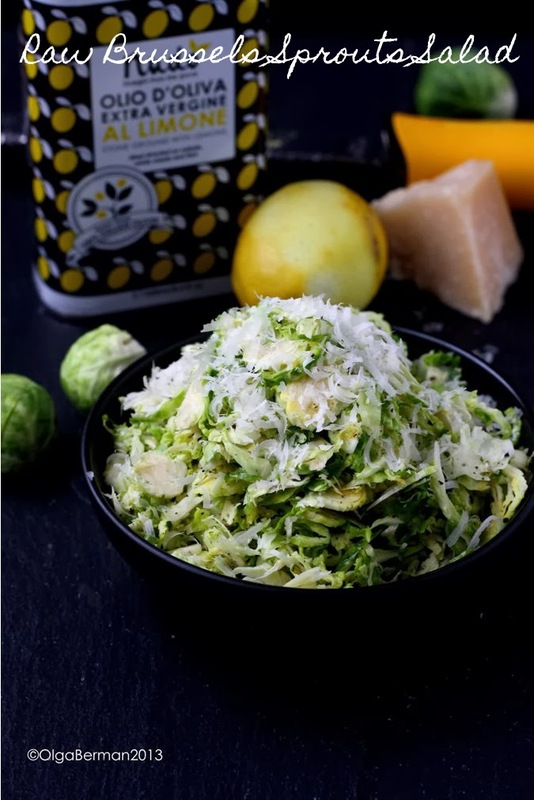 Today I bring you a recipe for Raw Brussels Sprouts Salad using a lemon infused oil from Nudo Italia. Not only does Nudo Italia allows you to adopt your own olive tree in Italy (how cool is that? ), they also ship great olive oils, pastas, and tapenades. 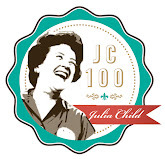 I've given some of their products as gifts and everyone loved them. For Day 6 of the Eight Days of Hanukkah Giveaway, I received a beautiful Quattro Stagioni gift box. The set contains First Cold Press Extra virgin olive, Extra virgin olive oil crushed with real lemons, Extra virgin olive oil with Sicilian chillies, and Extra virgin olive oil crushed with fresh basil. Because I've already use the other three flavors in the past, I decided to give the oil with real crushed lemons a chance and create a recipe using it. 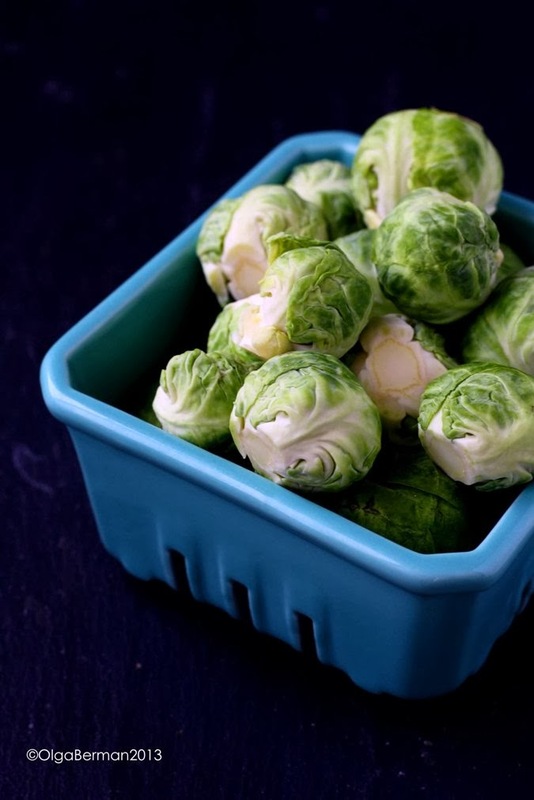 If you are not willing to give raw Brussels sprouts a chance, you can saute the sprouts first in the oil and then add the rest of the ingredients for a cooked side dish. Use the code MTCITRUS to receive 50% off the Citrus Club Box, which contains a tin each of extra virgin olive oil, zesty lemon oil, and stoneground mandarin oil. Perfect for any dish that needs some fresh citrusy inspiration. $19 with discount code. 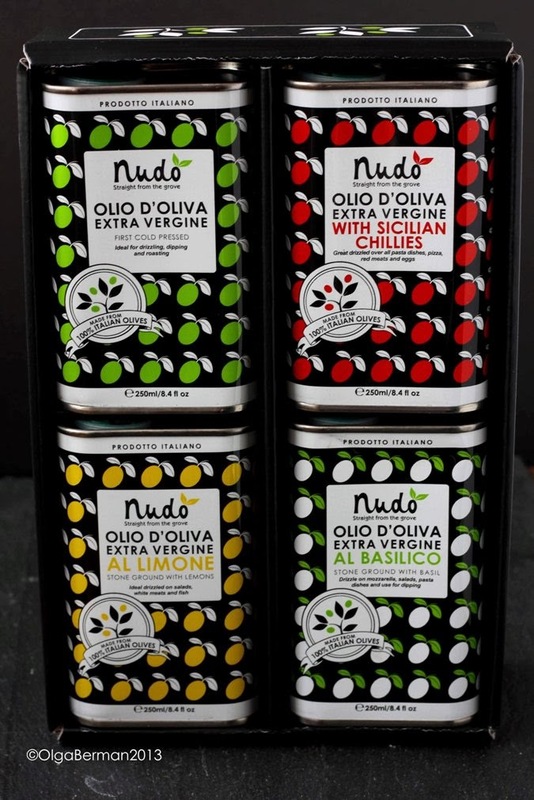 Use the code MTFLAVOR to receive 40% off the Flavor Box Set, which contains 8 tins of Nudo's freshly pressed, beautifully packaged flavored olive oils, including Extra Virgin Olive Oil, Lemon, Chili, Mandarin, Thyme, Basil, Garlic, and Mint. $60 with discount code. 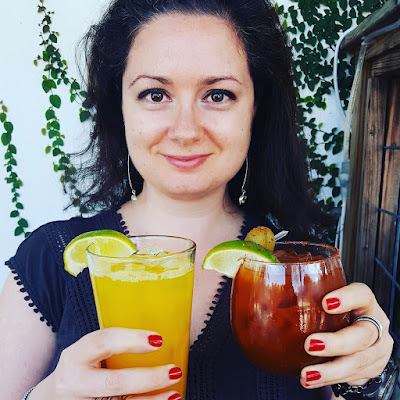 $20 off your first delivery on all Adopt-an-Olive-Tree personal subscriptions (just use code CYBERNUD69), as well as 20% off Adopt an Olive Tree gifts (with code CYBERNUD49). And now for a chance to win your own Quattro Stagioni gift box! 1) You must ♥ olive oil!! Disclosure: I received a set of oils from Nudo Italia and they will provide the same set for the winner of this giveaway. I have received no monetary compensation. All opinions are my own. Salad dressing...or hummus....or drizzled on some ricotta....so many possibilities! I love the design on the containers! LOVE the containers. I actually use them to hold pens on my fridge (once the oil is done, I wash out the container and super glue a magnet to its back to "hang" on my fridge). Would love to try the lemon olive oil on pasta with garlic and shaved Parmesan! I love chicken picatta so I would try to use the lemon oil to sautee the chicken before making it. That's an excellent idea! Love chicken with lemon and olives or capers. Never tried raw brussels sprouts. But this seems like a great combo! Especially with good quality extra virgin. Loving all the flavors of nudo. Where can I get them? Thank you for the chance to win this wonderful Quattro Stagioni gift box! Would use those gems on our fish. I would use the lemon olive oil as part of a salad dressing- sounds like a nice fresh option! Those lemony brussels sprouts look delicious! I'd also use the lemon oil over roasted broccoli, in salad dressings, and as a dip for fresh-baked bread. Roasting vegetables! or salad dressing. I haven't cooked with lemon olive oil before, but I think it would go great with broccoli, asparagus, or in a cream based pasta sauce. Thanks for the chance to win. I think it sounds divine on any raw veggie. Or maybe use it for an olive oil pound cake. I think the lemon oil would be awesome drizzled on ricotta and topped with sea salt and cracked pepper for a fun dip! I would use it for lemony roasted potatoes. I'd definitely use it in our homemade salad dressing, which contains lemon juice and olive oil, typically. Hmmm, lemon olive oil drizzled over olives, roasted with lemon zest, pepper flakes, with pine nuts, garlic, and charred bread! I think I'd use it in cake... Or maybe experiment with zesty dipping oil for a baguette...??? I would poach some cod in it, or of course, make an amazing salad dressing! I've never had Brussels sprouts raw! It sounds yummy. I'd LOVE to use the spicy oil in everything -- drizzled on freshly baked bread, as salad dressing, over fresh pasta...that stuff would disappear quickly from my kitchen. And the lemon kind, I would try in baking. Yummy! 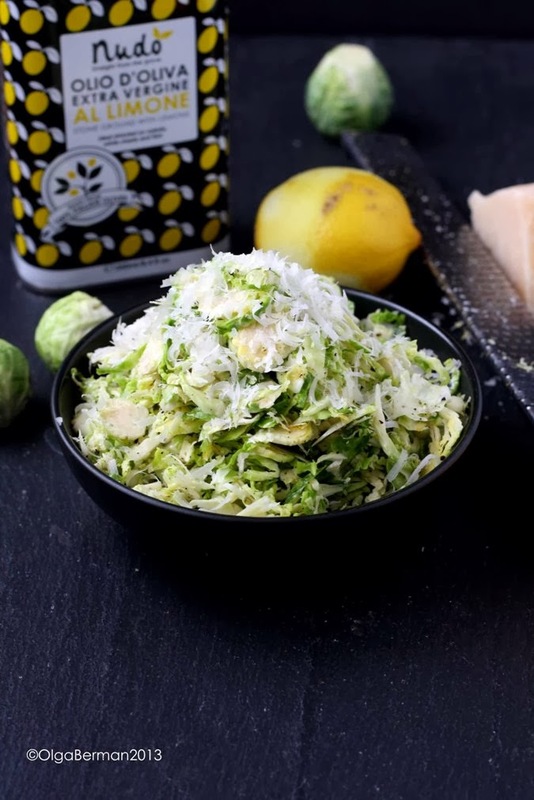 What a great idea, it's like brussel sprouts caesar salad! That's an awesome way to look at it!! I would drizzle it over spinach salad of course! Hmmm... not a burssel sprout girl, but I do love flavoured oils, and I've tried Nudo before, its good stuff! Darling, you know you can't really win since you don't live in US, right? But I do appreciate the comment and am glad you like the Nudo products ;) Their spicy oil is my favorite. The lemon oil looks delicious - I would make a marinade for salmon! I'd put it on some white fish and add some bubbly to make a yummy sauce. I would make a veggie dish.. .sounds wonderful. Use it for a vinaigrette for a salad with avocado, hearts of palms, and shrimp. I'd make some savory lemon and rosemary cornbread muffins with it.